Did you know you can create a wish list of books on our website? Yep. It’s true. You could use a wish list as just that, a wish list, something to jog your memory when it’s time to buy a new book or someone has given you a gift certificate. Your wish list can also be emailed, so you can use it as a gift registry for a birthday party, wedding, baby shower or some other celebration, or as a way to organize a book drive for your school or local library. 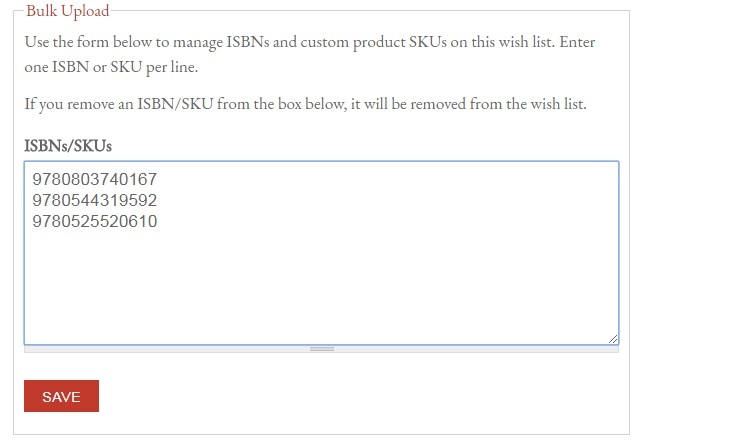 You can also now create multiple wishlists, so if you're a school librarian building libraries for a range of ages and greats or just a bookworm who likes to keep your reading and gifting organized, our wishlists can help you keep everything straight. Here’s how to set one up. Start by clicking on “Login,” in the upper right corner, even if you don’t have an account with us yet. Next, login with or create a Porter Square Books account. Once you’ve created a list, you can change the expiration date (after the party, wedding, shower, etc) or not. You can re-name it or put a different name on it. You can also remove items from it (assuming your begging has worked) or change the quantity you want of each book. You can now, even upload books in bulk to your list so you don't have to go clicking around the site. Just copy and paste ISBNs to the list shown below andclick save. 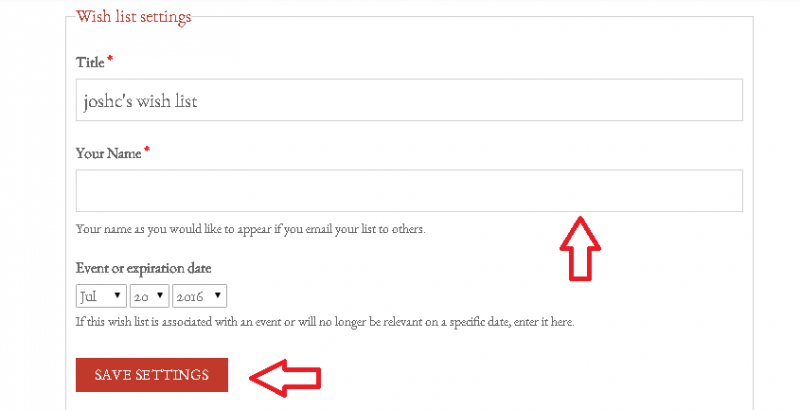 To email your list simply click on “Email Wish List.” You can send it to up to 10 email addresses at once, give it a custom subject and include a message. There will be a link to the list at the bottom of the email. When someone buys a book from the list, the “Add to Cart” button in the book’s listing will be replaced with “Fulfilled.” If you were asking for say, ten copies of To Kill a Mockingbird, for you school, and one person buys one copy, the “Wanted” number will change to “9” and the “Have” number will change to “1” until all ten have been purchased. If you realize you actually need more copies than you originally asked for you, you can change that as well. 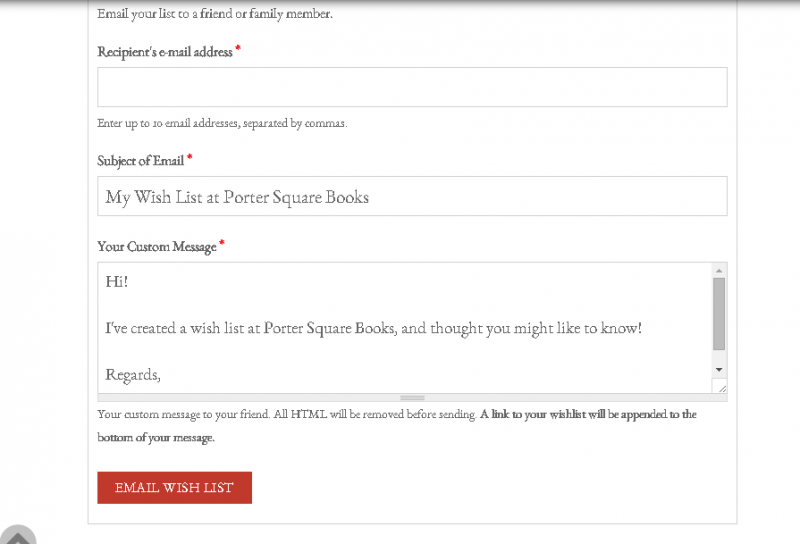 If you happen to leave portersquarebooks.com to, I don’t know, work or go outside or something, and you need to get back to your wish list, just login (or if you’ve set it up to automatically login in, click on your user name). You’ll be brought to this screen. Just click “Wish List,” and you’re there.